Kick off your visit on the 1st (Mon): make a trip to Lombard Street and then take in the views from Golden Gate Bridge. Get ready for a full day of sightseeing on the next day: make a trip to Ferry Building Marketplace, hunt for treasures at Ferry Plaza Farmers Market, then take in the waterfront at Fisherman's Wharf, and finally head off the coast to Alcatraz Island. To find ratings, photos, reviews, and other tourist information, read our San Francisco day trip planning website . London, UK to San Francisco is an approximately 14.5-hour flight. You can also do a combination of flight and train. The time zone changes from Greenwich Mean Time to Pacific Standard Time, which is usually a -8 hour difference. Prepare for somewhat warmer weather when traveling from London in April: high temperatures in San Francisco hover around 22°C and lows are around 12°C. Cap off your sightseeing on the 3rd (Wed) early enough to travel to Los Angeles. 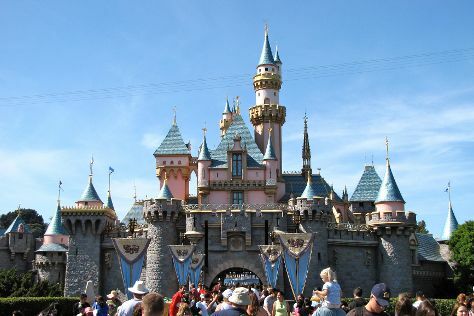 Kick off your visit on the 4th (Thu): discover the magic at Disneyland Park. Get ready for a full day of sightseeing on the next day: take in the waterfront at Santa Monica Pier, then examine the collection at The Getty Center, then make a trip to Hollywood Walk of Fame, and finally see the sky in a new way at Griffith Observatory. To find other places to visit, reviews, traveler tips, and other tourist information, read our Los Angeles trip planner . Getting from San Francisco to Los Angeles by flight takes about 4 hours. Other options: do a combination of train and flight; or drive. Traveling from San Francisco in April, expect nights in Los Angeles to be about the same, around 15°C, while days are a bit warmer, around 28°C. Cap off your sightseeing on the 6th (Sat) early enough to travel to Las Vegas. On the 6th (Sat), take in breathtaking views at Red Rock Canyon National Conservation Area, take in panoramic vistas at Eiffel Tower Viewing Deck, and then ponder the design of Bellagio Fountains. Get ready for a full day of sightseeing on the next day: see the interesting displays at The Mob Museum, admire the natural beauty at Bellagio Conservatory & Botanical Gardens, and then get a taste of the local shopping with The Strip. To see traveler tips, more things to do, and tourist information, you can read our Las Vegas road trip website . You can fly from Los Angeles to Las Vegas in 4 hours. Alternatively, you can drive; or take a bus. In April, daily temperatures in Las Vegas can reach 31°C, while at night they dip to 16°C. Wrap up your sightseeing by early afternoon on the 8th (Mon) to allow time for travel to Houston. Kick off your visit on the 9th (Tue): admire the masterpieces at Museum of Fine Arts, Houston, stroll the grounds of Glenwood Cemetery, and then test your team's savvy at popular escape rooms. To find traveler tips, reviews, maps, and other tourist information, go to the Houston planner . Fly from Las Vegas to Houston in 6 hours. Alternatively, you can drive; or take a bus. The time zone changes from Pacific Standard Time to Central Standard Time, which is usually a 2 hour difference. In April, daytime highs in Houston are 30°C, while nighttime lows are 19°C. Wrap up your sightseeing on the 10th (Wed) to allow time to travel to New Orleans. New Orleans is known for historic sites, museums, nightlife, shopping, and parks. Your plan includes some of its best attractions: learn about all things military at The National WWII Museum, get to know the fascinating history of Jackson Square, go on a hair-raising tour with a ghost and vampire tour, and stroll through New Orleans City Park. For ratings, photos, traveler tips, and more tourist information, read New Orleans day trip planning site . Traveling by flight from Houston to New Orleans takes 4 hours. Alternatively, you can do a combination of flight and car; or drive. When traveling from Houston in April, plan for a bit cooler days in New Orleans, with highs around 25°C, while nights are somewhat warmer with lows around 25°C. Finish your sightseeing early on the 12th (Fri) to allow enough time to drive to Orlando. Have a day of magic on the 13th (Sat) at Walt Disney World Resort. Pack the 14th (Sun) with family-friendly diversions at Universal Orlando Resort. There's still lots to do: get in on the family fun at Universal's Islands of Adventure, discover the magic at Happily Ever After Fireworks, laugh and play at SeaWorld Orlando, and look for gifts at MacroBaby. To see other places to visit, reviews, ratings, and more tourist information, read our Orlando online vacation planner . You can drive from New Orleans to Orlando in 10.5 hours. Another option is to take a bus. Due to the time zone difference, you'll lose 1 hour traveling from New Orleans to Orlando. Expect somewhat warmer weather when traveling from New Orleans in April: highs in Orlando hover around 34°C, while lows dip to 21°C. Cap off your sightseeing on the 18th (Thu) early enough to go by car to Miami. 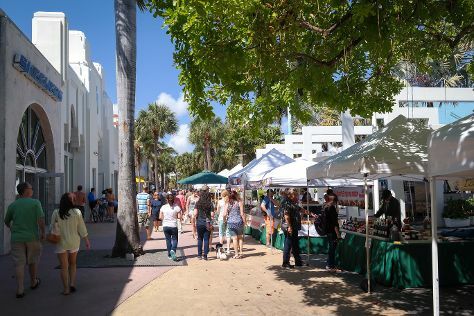 Start off your visit on the 19th (Fri): examine the collection at Vizcaya Museum and Gardens, then take a stroll through Lincoln Road, then wander the streets of Art Deco Historic District, and finally make a trip to Bayside Marketplace. Get ready for a full day of sightseeing on the next day: enjoy the sand and surf at Fort Lauderdale Beach, then learn about all things military at Naval Air Station Fort Lauderdale Museum, and then tour the pleasant surroundings at South Beach. To see where to stay, other places to visit, and other tourist information, you can read our Miami visit planner . Drive from Orlando to Miami in 4 hours. Alternatively, you can take a bus; or take a train. Traveling from Orlando in April, expect somewhat warmer with lows of 25°C in Miami. Finish up your sightseeing early on the 20th (Sat) so you can travel to Washington DC. Washington DC is known for museums, historic sites, nightlife, zoos & aquariums, and parks. Your plan includes some of its best attractions: explore the world behind art at National Gallery of Art, admire nature's wide array of creatures at National Zoological Park, appreciate the history behind Vietnam Veterans Memorial, and admire the striking features of Washington National Cathedral. For ratings, photos, traveler tips, and other tourist information, read our Washington DC day trip planner. Getting from Miami to Washington DC by flight takes about 4.5 hours. Other options: do a combination of flight and train; or drive. Traveling from Miami in April, expect nights in Washington DC to be much colder, around 11°C, while days are little chillier, around 23°C. Wrap up your sightseeing on the 23rd (Tue) early enough to take a train to Philadelphia. Kick off your visit on the 24th (Wed): get a sense of history and politics at Independence Hall, explore the world behind art at Philadelphia Museum of Art, and then take in the pleasant sights at Longwood Gardens. Here are some ideas for day two: take an in-depth tour of Eastern State Penitentiary, then admire the masterpieces at Barnes Foundation, then browse the eclectic array of goods at Reading Terminal Market, and finally appreciate the history behind Liberty Bell Center. To find maps, where to stay, photos, and other tourist information, go to the Philadelphia planning site . Traveling by train from Washington DC to Philadelphia takes 2 hours. Alternatively, you can drive; or take a bus. April in Philadelphia sees daily highs of 21°C and lows of 8°C at night. Finish up your sightseeing early on the 25th (Thu) so you can catch the train to New York City. New York City is known for museums, nightlife, shopping, historic sites, and parks. Your plan includes some of its best attractions: go for a walk through Central Park, admire the masterpieces at The Metropolitan Museum of Art, examine the collection at 9/11 Memorial, and admire the striking features of Rockefeller Center. To find traveler tips, other places to visit, and other tourist information, refer to the New York City trip itinerary maker site . Traveling by train from Philadelphia to New York City takes 2 hours. Alternatively, you can drive; or take a bus. In April, daily temperatures in New York City can reach 19°C, while at night they dip to 8°C. Wrap up your sightseeing on the 29th (Mon) to allow time to travel to Boston. Kick off your visit on the 30th (Tue): look for gifts at Brookline Booksmith, explore the world behind art at Museum of Fine Arts, and then explore and take pictures at Fenway Park. Get ready for a full day of sightseeing on the next day: appreciate the extensive heritage of Freedom Trail, then get curious at Museum of Science, and then admire the natural beauty at Boston Public Garden. To see maps, more things to do, photos, and other tourist information, you can read our Boston online visit planner . You can do a combination of bus and flight from New York City to Boston in 3 hours. Other options are to fly; or drive. Prepare for a bit cooler weather when traveling from New York City in April: high temperatures in Boston hover around 15°C and lows are around 5°C. Wrap up your sightseeing on the 1st (Wed) to allow time to travel back home.